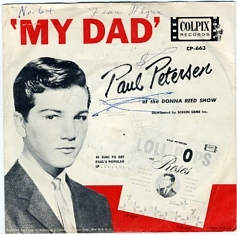 “Dad Rock” is a term for all that old ’60s and ’70s music that today’s dads listen to. I’ve seen references to it online, heard my kids mention it, and I’ve even tuned into a radio show called Dad Rock. Understanding the demographic of this site, I think it’s fair to say many of us have Dads that are from the pre-rock era. That’s the case for me, too, but that didn’t mean we didn’t have any rock(ish) records in the family record collection when I was a kid. My parents were in college when rock and roll emerged, and were graduates when it was only a couple of years old. To them, rock and roll was teen music, utterly beneath them. In the 1950s, the median age for getting married was 20 for women and 23 for men; if you were in your 20s, it’s safe to say you identified as a grown-up. My dad was an amateur musician and was in charge of entertainment on his army base in Germany, but he never ran into Elvis (who was there at roughly the same time). In 1977, he and my mom were dragged by another couple to go see Elvis on what would be his last tour; they attended ironically and the performance simply confirmed their long-held biases. But they had been liberal young parents in the ’60s. We had a Pete Seeger record stuck in among the jazz, classical, light opera, and show tunes albums. And they were not completely closed off from the pop culture. Indeed, I think they tried to like rock at some point in the late ’60s or early ’70s, but didn’t get too far. I think my dad, despite not really getting rock (I remember one conversation I had with him where he had no clue who Chuck Berry was) respected the Who’s crack at making an opera. He never listened to the album much, but he liked owning it and I believe he went to see the movie version, and possibly the stage show. Dad turned 80 the other day. We got him tickets to Madame Butterfly. 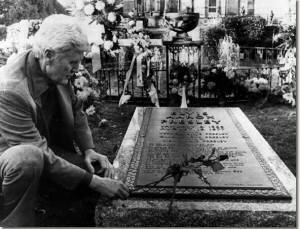 I was not aware that Elvis died 36 years ago today…until a few minutes ago. He did. He’s still dead. Someone in USA Today, of all places, wrote a fairly humorous piece on what might have become of Elvis had he only nearly died that August day in 1977. We could do better, I’m sure, but this is not a laughing matter. What’s the closest you got to Elvis? My Mom saw him in concert a couple of years before he died and caught a sweaty Elvis scarf. I’m sure she still has that packed away somewhere. What do you think Elvis’ high and low points (post-1977) might have been had he lived into the 21st century, or even still been alive? Our culture is always on the lookout for the “Next” whomever or whatever: The Beatles, Bob Dylan, Bruce Springsteen, Michael Jordan… Have we given up on identifying the Next Elvis Presley? What Role Would You Have Played With Elvis? Amazing insights in this clip from “Dr. Nic,” who played surrogate father, counselor, minister, and drug dealer, among other roles.